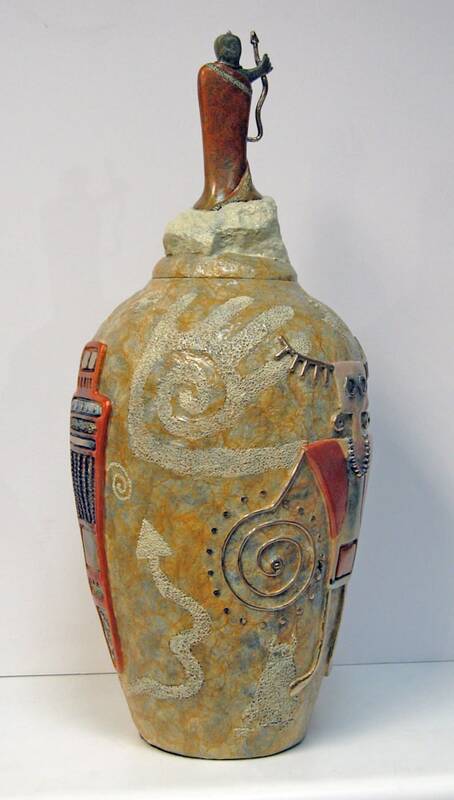 " I chose the bronze vessel "The Spirits Within" to introduce viewers to my love of rock art. For many years, I have photographed, drawn, painted and now sculpted the various images. Rock art symbols were created in two ways, pictographs (paintings on the rock surface) and petroglyphs (incised or engraved into the stone with sharp objects or another stone). The true meaning of these symbols are not known, but we do know that the animals, plants, inanimate objects such as circles and lines, human figures and human-like figures known as anthropomorphs were all very important to the Native American people that created them. They left us a tremendous visual diary of their life. When you view this vessel, you will see incised images in the background of numerous petroglyphs. These are subtle and as you would normally find on a rock surface. In their natural surroundings some designs are bold and stand out on the rocks while others will be missed completely if you are not looking closely. Some of the figures you will see on the background of my vessel are a bearpaw, mask, handprint, snake, owl, bear, mountain sheep and other geometric images. 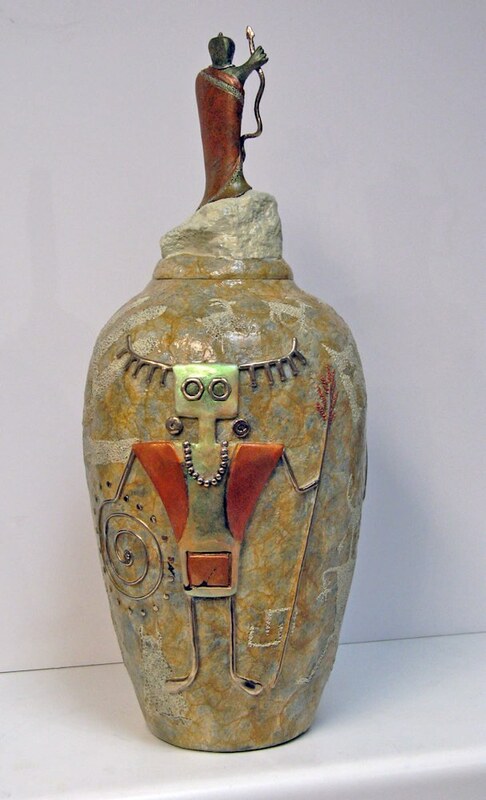 The main emphasis of my vessel is the use of the anthropomorphic figures.I have been fascinated with them from my first view of them on the rock surfaces. I chose four images that were extremely interesting to me. The original images are found in sites located in Southern California and Utah, although figures that are similar are found throughout the Western United States. The designs of all of the images are very close to the originals even though I have used my artistic license to produce them as three-dimensional figures. All of the images are different in body shape, designs and decorations. The majority of the them are highly decorated and have headdresses or ornamentation, such as feathers, fringe, jewelry and clothing on their bodies and heads. Their hands and arms, if they have them, are generally upraised and holding various ceremonial objects. After extensive research, I have found only theories and individual ideas of what the various images represent. There are books published that attempt to explain the images, but they are only an educated guess. The images are generally explained as a ceremonial or ritual activity that was important to the ancients. Therefore, they could represent shamans, deities or spirit beings. There are numerous other ideas presented, including visitors from the realms of outer space. I have given the image on top of the vessel the title "Spirit Keeper". Since the purpose of the images and the meaning of them will never truly be known I felt that they needed a "keeper". He would be there, in place of the original creators, to protect the purpose and meaning of these intriguing symbols. I feel that anyone that ever has the opportunity to view the rock art symbols on the canyon walls, in caves or on rock outcroppings will immediately be fascinated with the people who created them and will be in wonder about their lives and history. 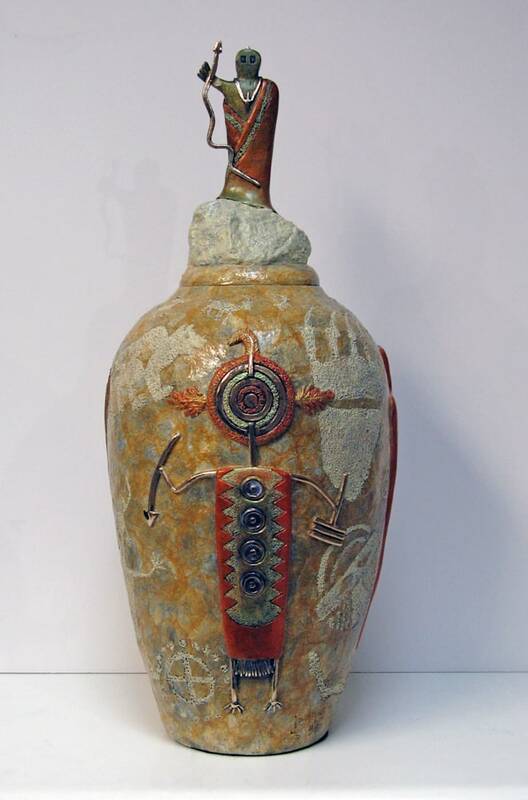 I hope you enjoy my vessel "The Spirits Within". It will always hold the secrets of the creators."